CGN’s popular Lake Geneva boat cruises from Genève to Lausanne via Nyon and Yvoire on lac Léman take just less than four hours. A pleasure boat trip from Genève to Lausanne is one of the most popular day-trip cruises on Lake Geneva in Switzerland. The one-way cruise is just shorter than four hours and call en route at various stop including Yvoire and Nyon. 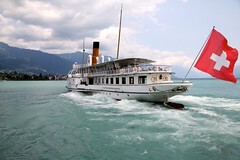 Historic Belle Époque paddle steamers are the most pleasant way to cruise on Lac Léman with gourmet lunch and dinner (optional) served on mealtime cruises. Mt Blanc can be seen from various parts of the lake near Genève. Genève is at the southwestern corner of the croissant-shaped Lake Geneva. Boats frequently depart from the city on circular sightseeing and lunch cruises or to nearby towns but the grandest cruise is the almost four-hours trip to Lausanne on the northernmost curve of Lac Léman. The boats turn around fairly fast on the return trip making it near impossible to do sightseeing in Lausanne or Geneva and return by boat on the same day. Return by train if planning to do sightseeing at the final destination. The grand cruise from Geneva to Lausanne is possible twice daily in each direction during the summer season (late June to early September). During the spring (mid-April to late June) and autumn (early September to late October) the cruise is possible once daily on weekends in each direction with cruises turning at Nyon or Yvoire more frequent. Boats do not stop at all ports on every cruise and sometimes boats may call at Nyon and Yvoire in reverse order. 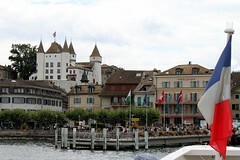 Many further cruises follow the same route but terminate in Yvoire or Nyon – both towns very popular with day-trippers from the larger Lake Geneva cities. (A frequent ferry service link Nyon and Yvoire in 20 minutes.) In high summer, a direct service from Lausanne reaches Yvoire in just more than an hour. In smaller towns, finding the landing jetty of CGN lake boats is simple but in Geneva, four different landing quays are used. The most important departure point for CGN boats from Geneva is Genève-Mont Blanc – most cruises end or start from here. However, a few cruises – notably lunch and dinner cruises – often depart from Genève-Jardin Anglais, which is on the opposite end of the lake across the Rhone River nearer to the old town. It is a flat but at least ten to fifteen minutes’ walk between the two stops. Further CGN landings in Geneva are Genève-Pâquis near the Mt Blanc stop and Genève-Eaux-Vives outside the port area near the Baby Plage beach. Many, but not all, boats call here en route to and from the Jardin Anglais or Mt Blanc. Boats stop in Lausanne-Ouchy – a lovely neighborhood and home to the Olympic Museum but quite a distance from downtown Lausanne and the train station. To reach central Lausanne, take the metro from Ouchy – the entrance is across the road from the boat landing. The metro is CHF3.70 well spent (steep but not as steep as the hills when walking) – or free if the train ticket has Mobilis Zone 11 included. The specific routing can influence the price but not the type of boat making it worth scouring the timetables for when the historic Belle Époque paddle steamboats are cruising. Same-day return on the boat is around 15% cheaper than two single tickets. On a Geneva-Lausanne return, it is better value to buy a day ticket – CHF64 (CHF90 in first class). All standard Swiss transportation and Swiss Railways passes and discounts can be used on CGN boats. 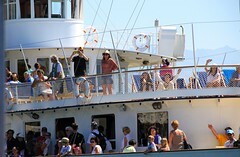 See Savings Deals on Lake Geneva Cruise Boats for more details. A good savings option, which is essential if planning to do sightseeing at the end of the cruise, is to return by train. Trains connect Geneva and Lausanne around five times per hour in 33 to 48 minutes. The standard one-way fare is CHF23 (CHF40.40 first class) irrespective of the train used. Nyon is halfway between Geneva and Lausanne and also a very good town from where to take the train. Train and boat tickets can be bought at the same time but the tickets are not interchangeable, i.e. the train ticket is not valid on the boat and v.v. See also Ferry Boats and Pleasure Cruises from Lausanne on Lake Geneva for more cruising options on Lac Léman from Lausanne-Ouchy.